MOB or Man overboard is something that you really don't want to experience while at sea (or really anytime) so they teach you in sailing school how to deal with it. While practicing it is ideal to have 3 people, each with specific roles . One person steers the boat, one person watches the MOB at ALL TIMES, and continues to point at them to guide the captain, and the third person (and others if avaliable ) assist the MOB aboard when they are rescued. When you only have 2 people on board, and one of them is the MOB, then you have a very difficult situation. 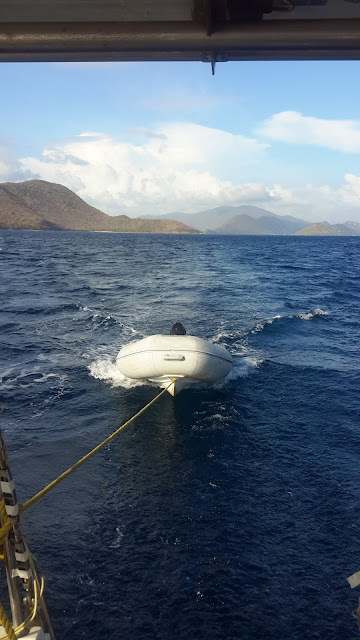 After several close attempts I decided to get in the dinghy (Melody) which we tow behind Rhapsody. This is why we have a very strict rule aboard Rhapsody. Under no circumstances are either of us allowed to be a MOB!